GoToTibet.com provides various private tours and well-chosen small group tours at affordable prices. As a professional Tibet tour operator, our mission is to guarantee you a high-quality and worry-free trip. You'll learn the rich history, feel the authentic culture, experience the breathtaking landscapes of Tibet. We offer not only regular tour itineraries, but also trekking, cycling and motorbike tours in Tibet. Or we can also customize the most suitable Tibet tour for your individual needs. Our well-trained and knowledgeable consultants will help you organize the best Tibet travel package that fits your budget. GoToTibet.com, a leading Tibet travel agency, will ensure you an enjoyable journey on this holy land. 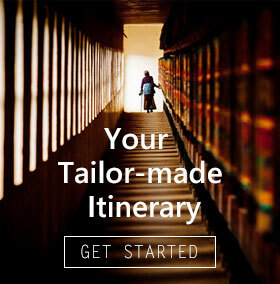 We are at your service to make your Tibet dream come true. GoToTibet.com offers various small group tours with guaranteed departure dates. The tours cover the most popular destinations with unbeatable budget price and great service, such as a city tour in Lhasa, an expedition tour to Mt. Everest or an overland tour to Nepal, etc. Our affordable group tour packages max out at around 12 people. You needn’t bother to plan the details yourself, just travel with us and get the most out of your money for a safe and pleasant trip in Tibet. 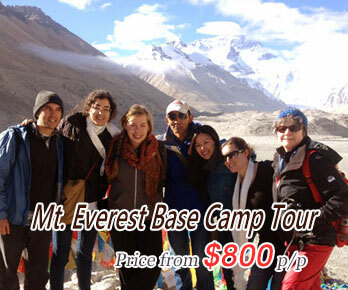 7 days overland adventure tour from Lhasa to Kathmandu via Everest Base Camp. Exploring the best of Tibet from Lhasa to Nepal border. Travel from Tibet to Nepal by overland with no hustle, and you’ll have more time to enjoy the stunning view of the mighty Everest! Not only Everest Base Camp, you'll also visit two of Tibet's holy lakes: Yamdrok Lake and Namtso Lake. Enjoy the smell of nature! We have various private tours for you to choose. We can also design your Tibet tour according to your specific requirement. The tour program can be tailor-made just for you. This tour option will bring your Tibet travel with more freedom and flexibility, also you can get more customer-oriented services from our hospitable guide and driver who will only care for you and family. Just send us your outlined Tibet travel plans, and our staff will help create a perfect Tibet tour for you. Tibet, situated over 4000 meters above the sea level. Its special geographic conditions, the high mountains, deep valleys and endless plains of Tibet offer incredible opportunities for trekking. 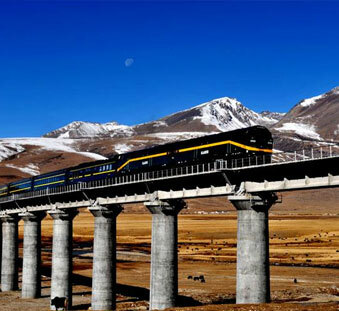 China has abundant tourism resources, so why not travel Tibet with some attractive destinations in China? You can explore the featured highlights of Beijing (Great Wall & Forbidden City), feel the ancient pulse of history and culture in Xi’an (Terracotta Warriors), challenge the spicy local cuisine in Chengdu (Pandas & Hotpot), and meet the devout pilgrims on the holy land of Lhasa. You are warmly welcome to discover the diverse beauties of the country with GoToTibet.com. All foreign tourists are required to get a Tibet Tourism Bureau (TTB) permit for visiting Tibet. Furthermore, an Alien Travel Permit is additionally needed for the trip to Everest Base Camp, as well as a Military Permit for the trip to Mt. Kailash or other sensitive border areas. All the permits will be organized by travel agencies on our side as part of our service, and the permit application process generally takes 15-20 work days depending on different routes of your Tibet tour. You can see more details below. What is Alien's Travel Permit? What's required for Tibet Permit? How to apply for Tibet Entry Permit? Tibet seems like a mystery lies in the corner of the world, but for the Buddhists, it lies in the center of the world. This magical land has a vast territory and few inhabitants, covered with snow-capped mountains, lush forests and turquoise holy lakes. Here are some refined advice for you like where to visit, when to start your tour, how to get to Tibet, what to pack, etc. Demolition of Guangming Teahouse in Lhasa Guangming Teahouse used to be a well-known old brand teahouse. Sadly the demolition of Guangming Teahouse is a major event in the lives of locals recent days. Tibet travel to become easier for foreigners in 2019 Tibet Autonomous Region plans to cut the time for issuing travel permits to overseas tourists by half in 2019, which means the foreign travelers could get their Tibet permit in about 1 week. More flights to Tibet open on March 31, 2019 With the increasing demand of transportation into Tibet, Zhengzhou-Lhasa flight by West Airlines and Yinchuan-Lhasa flight by Tibet Airlines will be opened from March 31, 2019. QWhen is the best time to go? ATibet can be visited any time of year, though some times are better than others. The best time for your Tibet trip is from April to November, avoiding the cold and dry weather from December to February. QIs it easy to find an ATM in Tibet? AYou won't have any problems finding an ATM in Lhasa and Shigatse, although you probably won't be able to find one in remote areas or the smaller towns. However, this situation is changing, and ATMs are gradually spreading out across the land. QCan I see a sky burial in Tibet? ATo respect customs, unless you are invited by local Tibetan families, you have no chance to view sky burials or take photos of the practice, or do anything that is blasphemous around.